Sighisoara, Romania - 07/08.05.2019. SOLD OUT! Birmingham, the United Kingdom 04/05.05.2015. SOLD OUT! Warsaw, Poland - 09/10.07.2015. with CM Leung SOLD OUT! Dublin, Ireland - 13/14.07.2015. SOLD OUT! Cracow, Poland - 15/16.09.2015. with Nik Pekridis SOLD OUT! Zagreb, Croatia 06/07.10.2015. SOLD OUT! Bucharest, Romania 14/15.10.2015. with Marian Sterea SOLD OUT! Kuala Lumpur, Malaysia 03/04.11.2015. SOLD OUT! Johor, Malaysia 06/07.11.2015. SOLD OUT! Napoli, Italy 30/31.03.2016. with Salvatore Dimino SOLD OUT! Athens, Greece 15/17.04.2016. SOLD OUT! Istanbul, Turkey 26/27.04.2016. SOLD OUT! Bangkok, Thailand -14/15.05.2016. SOLD OUT! Chicago, USA 28/29.09.2016. with Yanek Wasiek SOLD OUT! Skopje, Macedonia - 05/06.10.2016. with Marian Sterea SOLD OUT! Zagreb, Croatia 11/12.10.2016. SOLD OUT! Antalya, Turkey 05/09.12.2016. SOLD OUT! California, USA 04-17.02.2017. SOLD OUT! Ballymena, Northern Ireland 05.03.2017. SOLD OUT! Birmingham, the United Kingdom 18.03.2017. Monopoli, Italy 28.03.2017. SOLD OUT! London, the United Kingdom - 23/24.05.2017. with Dumitrel Rada SOLD OUT! Warsaw, Poland - 11/12.09.2017. with Roger Tan SOLD OUT! Bucharest, Romania - 19/20/21.09.2017. with Sakis Batzalis and Marian Sterea SOLD OUT! Zagreb, Croatia - 03/04.10.2017. with Damjan Fiket SOLD OUT! Athens, Greece 01/02.11.2017. SOLD OUT! London, UK - SWPP 2 Masterclasses 11/12.01.2018. Las Vegas, USA 26.02.2018. WPPI SOLD OUT! San Jose, Costa Rica 05/06.03.2018. SOLD OUT! São Paulo, Brasil 13/14.03.2018. SOLD OUT! New York, USA - Photoplus 27.10.2018. London, UK - SWPP Superclass and Masterclass 16/17.01.2019. Las Vegas, USA 27.02.2019. WPPI SOLD OUT! What can you expect in Oslo, Norway? 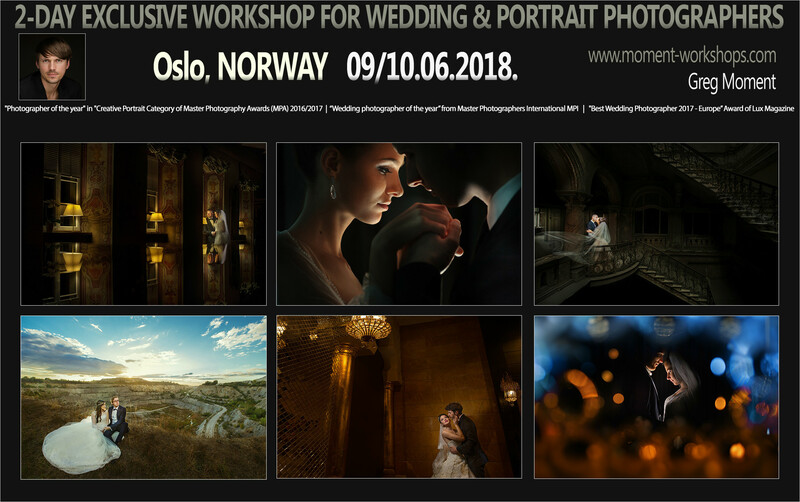 This time Greg Moment (www.moment.com.pl) provides two-day-long workshops for wedding photographers in Oslo, Norway. First day – shooting and e-marketing advanced tips. Second day – editing and retouching. ► You will see how Greg Moment creates his vision and style in Photoshop at the end, using Wacom's tablet. The photographers will receive official certificates at the end. The fee: 6000 NOK. Group around 15-20 photographers. The deposit of 2000 NOK is required to reserve a seat. Way of payment: PAYPAL or contact us to find the most convenient way of payment for you. Please, ask about availability before paying the deposit. Cancellations made less than one month before the workshop are non-refundable. Please note that hotel costs are not included with your workshop fee. Please note that lunch is not included with your workshop fee. or you can use the form below. If you are interested in my tutorials, lessons or workshop in your area - choose your country and sign up for my newsletter!